Hunter Mahan carded five birdies on the back nine in a closing 65 for a two-stroke win at The Barclays, the first of the four FedEx Cup play-off events. 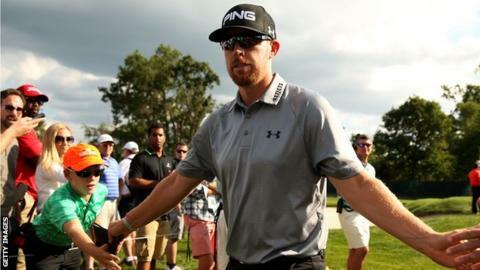 The 32-year-old finished on 14 under at the Ridgewood Country Club in New Jersey for his sixth PGA Tour victory. Stuart Appleby also shot a 65 to share second with overnight leader Jason Day. Rory McIlroy, who has won his last three tournaments including two major titles, closed with a 70 for a share of 22nd, nine strokes adrift. Despite a bogey at the last, Mahan earned his first PGA Tour victory since April 2012 and his sixth overall to propel himself into contention for one of Tom Watson's Ryder Cup wildcards. The California native twice represented the United States in the competition but missed out two years ago at Medinah. "It's the goal of every American and European player to play in the Ryder Cup. It means so much to us on both sides," Mahan said. "It's such a great competition. It brings out the best in everyone. It'd be a huge bonus to be a part of the team." England's Lee Westwood was one of 25 players who failed to qualify for the second play-off event - the Deutsche Bank Championship - after finishing level par for the tournament following a closing 70. However, compatriots Paul Casey (71) and Justin Rose (72) advance, as does Scotland's Russell Knox (71) and Northern Ireland's Graeme McDowell (72). England's Luke Donald and Ian Poulter missed the cut in New Jersey but are safely ensconced in the top 100.